Also Works on Mandolin, Lute, Dulcimer, Bouzouki, etc. 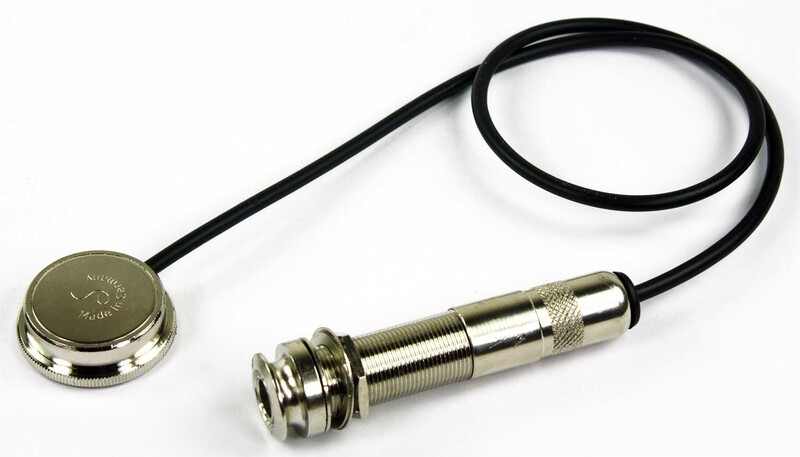 The Schaller Model 721 (10/82) Oyster Pickup consists of a single polished chrome piezo 'oyster' capsule and a pre-wired standard 1/4" input jack. The 721 Oyster pickup is specifically designed for use inside a guitar or acoustic bass. The Model 721 Oyster Pickup is mounted on the inside surface of the soundboard with thin adhesive film (included). Sound reproduction, as with all Oyster models, is extremely broadband, so further sound processing is usually not necessary. The Schaller Model 721 Oyster Pickup is well suited for steel or nylon string acoustic guitar and bass, and can also be used on a wide variety of other stringed, hollow body instruments such as mandolin, lute, dulcimer, autoharp, oud, bouzouki, harp and others. Not suitable for use with banjos or other instruments with minimal body resonance. Schaller's patented Oyster pickups provide powerful and lifelike sound reproduction of the instrument without the need for active circuitry and preamplification. The excellent sound reproduction is achieved through a unique combination of a specially designed membrane, a piezoelectric element and a plastic contact gel. All Oyster models attach with the included double-sided acoustic tape. Includes pre-wired sensor and jack, adhesive discs for sensor. Installation instructions are not included, but are available from the Schaller web site at www.schaller-electronics.com. Dimensions: 1" round sensor x 1/4" high; jack 1/2" x 1/2" x 1" with 1/4" threaded shaft, plus about 3/8" for lead wire terminals; sensor lead wire about 15" long.